Two powerhouses in the analytical sciences world, mass spectrometry and microscopic imaging, have been combined to make an even more impactful capability: mass spectrometry imaging (MSI). This technique allows scientists to locate and identify hundreds of molecules in complex samples without using a labeling compound. Applications include understanding microbial communication and microbial-plant interactions, localization of drugs in tissues for clinical and forensics research, and mapping biomolecules in tissues for understanding health and disease. Editors of the journal Analytical Chemistry invited Pacific Northwest National Laboratory's physical chemist Dr. Julia Laskin and analytical chemist Dr. Ingela Lanekoff to summarize key developments and applications of ambient ionization techniques based on liquid extraction used in MSI. Their review appeared in the Fundamental and Applied Reviews in Analytical Chemistry 2016 special issue. Ionization of neutral molecules in the gas phase is at the heart of mass spectrometry. Ambient ionization means that it occurs outside the mass spectrometer with little or no sample pretreatment required. The number of new ambient ionization techniques has grown substantially in the last decade. In their review, Laskin and Lanekoff focused on a subset of ambient ionization methods broadly defined as liquid extraction techniques, where molecules are extracted into a solvent before ionization. 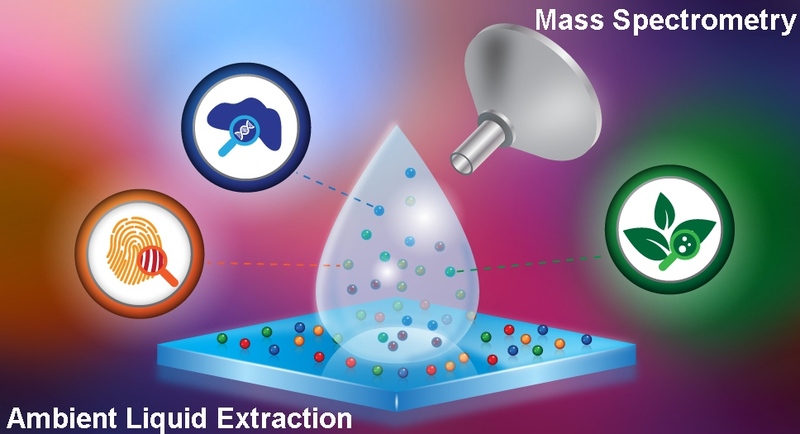 Some key advantages of liquid extraction techniques include its ease of operation, ability to analyze samples in their native environments, speed of analysis, and ability to tune the extraction solvent composition to a problem at hand. Laskin and her team are experts in the development of ambient ionization techniques based on liquid extraction. In 2009, they developed nanospray desorption electrospray ionization (nano-DESI), a novel ambient ionization technique that has been used in a variety of MSI applications. Lanekoff was a postdoctoral fellow in Laskin's group and now is an assistant professor at Uppsala University, Sweden. "Being invited to review ambient ionization techniques used in MSI is quite an accomplishment, given that five years ago we were not even on the radar in the mass spectrometry imaging community," said Laskin. "Our projects funded by the Chemical Imaging Initiative have allowed us to develop expertise in this exciting area of research." The Chemical Imaging Initiative is part of PNNL's Laboratory Directed Research and Development program, which funds creative and innovative work that serves to maintain the Lab's vitality in science and technology disciplines relevant to U.S. Department of Energy and national security missions. Sponsors: JL acknowledges support from PNNL's Chemical Imaging Initiative and a National Institutes of Health grant. Early development of nano-DESI was supported by DOE's Office of Basic Energy Sciences, Chemical Sciences, Geosciences, and Biosciences Division. IL acknowledges support from the Swedish Research Council and the Swedish Foundation for Strategic Research. Research at PNNL is performed at EMSL, a national scientific user facility sponsored by DOE's Office of Biological and Environmental Research. In One Sentence: PNNL scientists Julia Laskin and Ingela Lanekoff summarized key developments and applications of ambient ionization techniques based on liquid extraction used in mass spectrometry imaging. The Story in 106 Characters: PNNL experts reviewed and summarized key mass spectrometry imaging techniques for a special issue of Analytical Chemistry.